Eleutherococcus is from the Greek eleutheros meaning “free” and “kokkos” meaning pip or seed. In Latin senticosus is means ‘full of briars or thorns’, referring to the plant’s thorniness. In Russia, Siberian ginseng was originally used by people in the Siberian taiga (sub-arctic) region to increase performance and quality of life, and to decrease infections. 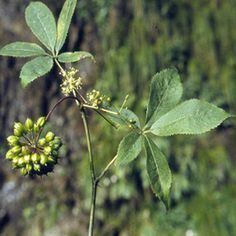 In the 1950s the term adaptogen was coined by Soviet scholars and they considered Siberian ginseng to be one of the most important adaptogens after Korean ginseng (Panax ginseng). Known as Ci Wu Jia in Chinese (and by its synonym Acanthopanax senticosus), Siberian ginseng is a widely used traditional Chinese herb that can invigorate qi (vital energy), strengthen the spleen and nourish the kidney in TCM. Polysaccharides (glycans); eleutherans. Galactose, glucose, maltose, sucrose, methyl-alpha-D-galactose (eleutheroside C); Phenylpropanoids: syringin and its monoglucoside (eleutheroside B), caffeic acid, sinapyl alcohol, coniferyl aldehyde; Lignans: sesamin (eleutheroside B4), syringoresinol and its monoglucoside (eleutheroside E1) and diglucoside (eleutherosides D and E); Triterpenoids: hederasaponin B, betasitosterol and its glucoside daucosterol (eleutheroside A), betulinic acid; Coumarins: isofraxidin and its monoglucoside (eleutheroside B1); Vitamins: vitamin E, provitamin A (betacarotene); Essential oil: 0.05% including isocaryophyllene and caryophyllene oxide. Do not use before bed as it may cause mental stimulation.